Capital Smart City(CSC) situated near Islamabad International Airport is an initiative of Future Developments Holdings (Pvt) Limited (FDH), which is one of the leading real estate developers and asset management company operating in Pakistan to develop new state of the art smart cities with a focus not only to give luxury living but also equal economic contributions. Through strategic investments, innovative urban planning, and lifecycle asset management, FDH creates integrated communities that embody international standards of sustainability with a strong commitment to quality. The society is located close to Thalian Interchange at about 9.2 KM distance from M-2 Toll Plaza. It has got easy access through Chakri road. 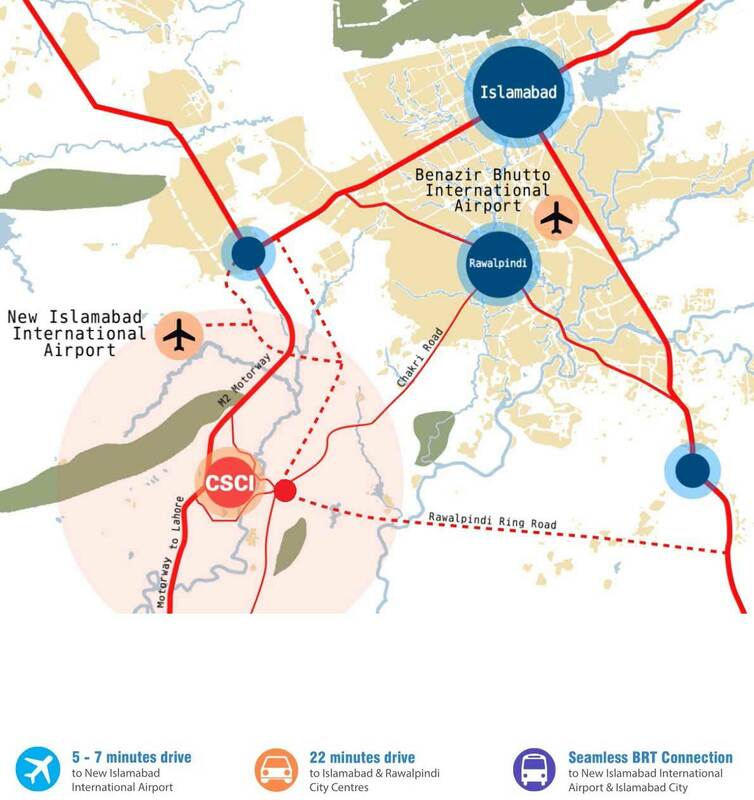 Excellent location of CSC makes it well-connected to the Islamabad International Airport and surrounding major urban centers via M2 Motorway. 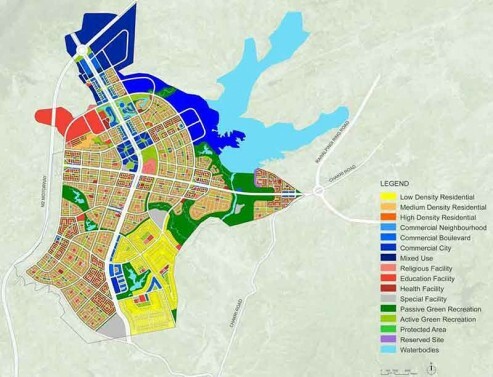 With the emerging economic opportunities in the region, Capital Smart City Islamabad is poised to establish itself as a regional center offering new business opportunities and accommodating the influx of population by creating a new center of economic, commercial, health, educational, recreational, housing and tourism facilities. The existing natural elements of forests, hills, and rivers surrounding the site provide an opportunity for scenic views, vistas, and potential green corridors. 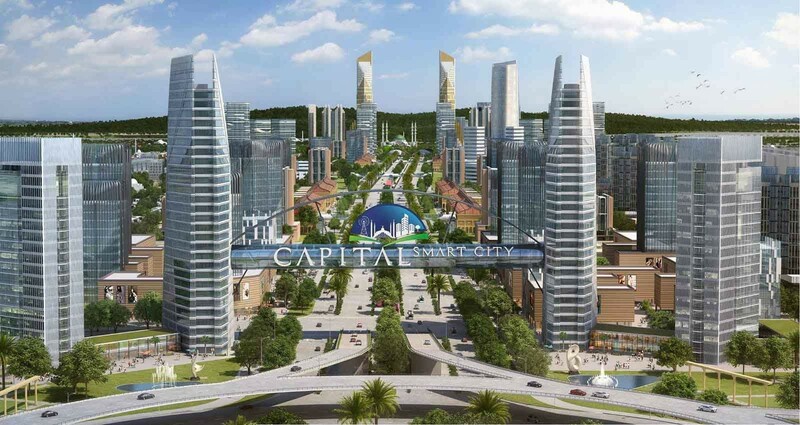 Capital Smart City Islamabad aims to become the first ever smart city in Pakistan and a model for sustainable development. The concept of the smart city revolves around a comprehensive urban management model which promotes efficiency and control on the one hand and inclusion and participation on the other. It leverages and harnesses modern technology to enable cities to function more reliably with sustainability for all residents. To become the first commercial center in the region; complementing the nearby Islamabad International Airport. Attract international businesses and investors. Create a variety of job opportunities in the commercial and service sectors. Provide state of art transport infrastructure with high regional growth. Achieve a sustainable transportation system. To ensure that well-connected networks are established for road users, pedestrians, cyclists and other future mobility needs. To provide state of the art transport infrastructure with high efficiency to support the city and regional growth. To design for resilient social infrastructure. Set an example for mixed-use and residential developments. To become an exemplary model for community planning in the region. Create convenient access to a full range of facilities. To become a destination for both international and local residents. A new religious center with a unique identity and architecture. A postcard city with iconic features and sceneries. To be the most eco-friendly development in the region. Provide adequate and reliable water supply. Conserve natural resources and ensure a zero-net loss of natural areas. An attractive city of natural vistas and sceneries. A convenient and walkable city. Master Plan integrates the existing rich natural features through eco-spines and seamless recreational trails. 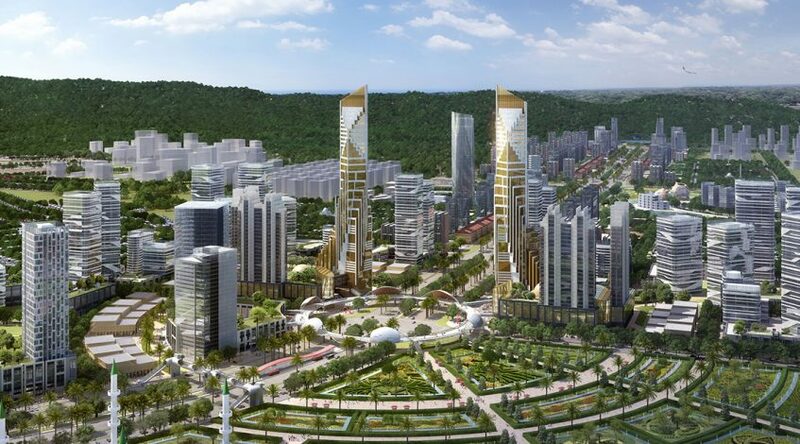 It also takes forward and integrates the existing land use and environmental value map to improve the urban environment by infusing a variety of parks and public open spaces including 18-hole PGA standard golf course and adventure zone, bringing people closer to social activities and nature. A strategic network of Capital Smart City Islamabad is structured on a gridded network of roads to maximize efficiency and connectivity, creating network resilience with a variety of possible routes to any destination. A link to the north of the city will serve as a bypass, carrying strategic commercial traffic around CSC. transport stations and nodes are promoted. It is located on CPEC route, near to new Islamabad International Airport. 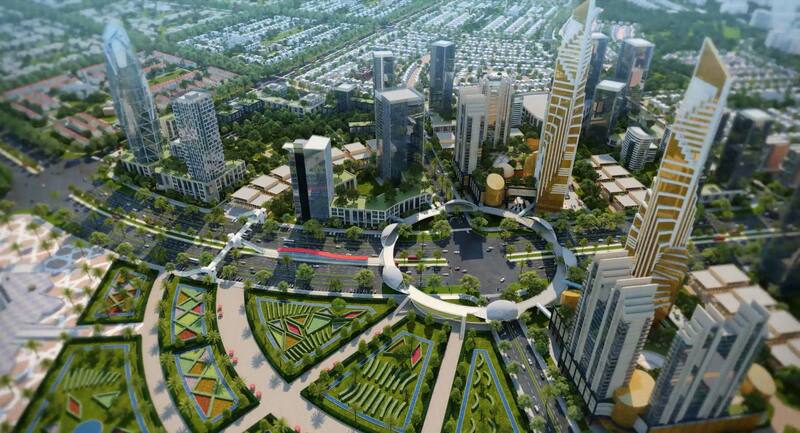 Panda city is conceived as the biggest trading hub for Chinese products in South Asia outside mainland China. It is divided into retail and logistics. It is housing the first Chinese themed grand mall of Pakistan known as ‘Panda Mart.’ The complex will be having 2000 retailers, 300 warehouses and last kilometer large scale logistic services. Education district is a part of Capital Smart City Islamabad dedicated for educational organizations. This area consists of institutions which enhances knowledge whether it be a school, college, university or vocational institutions. 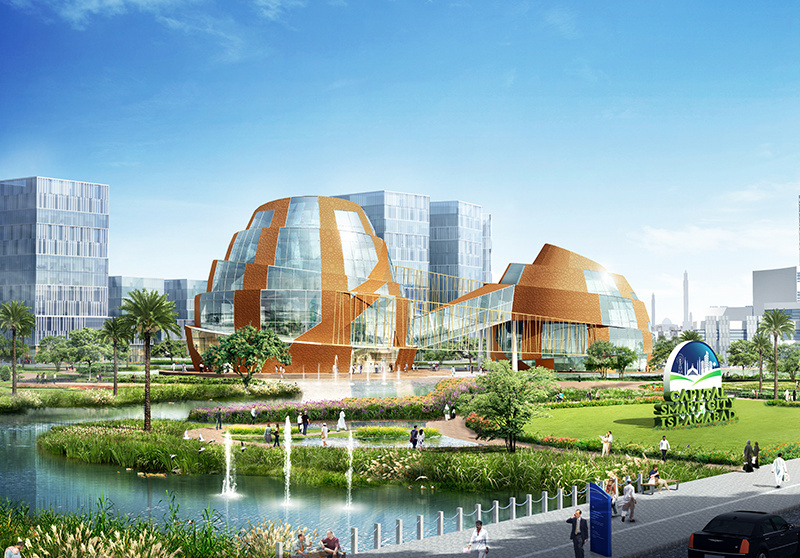 Education City comes with a number of supporting programs to assist in enhancing knowledge. The knowledge is not limited to age and thus our design symbolizes the same aim. This area is facilitated with easy and accessible transport systems and made it into a user-friendly zone with numerous and food outlets. Aviation District is the area dedicated to the aviation sector as the city is in the proximity of the Islamabad International Airport. A sector of the city having the program to house the aviation crew and will also have certain programs related to the name. Aviation district is a strategic area developed to be a commercial center and international logistics hub. This area serves for the logistics and hospitality for the aviation industry, as it is situated near the new Islamabad International airport which houses 16 million passengers per year. Aviation district comprises airport city, logistics facilities, aeronautics, hospitality, and food beverages. Healthcare district is an urban landmark to provide health care facilities to the people. It is the area which provides opportunities for Individuals and corporations to advance their healthcare services and to keep the community healthy. The purpose-built hospitals focus on the environment and the ease of access for the users. The labs are one of its kind and are a symbol of technological advancement. The healthcare district is uplifted with various parks and food and beverages. Lake View Terrace is the serene area of Capital Smart City Islamabad where one can be very close to nature. Green landscape infused with blue water lake gives a refreshing experience. It is the best place to enjoy dawns and dusks at CSC. The residences provide a direct relation to nature. Capital Smart City Islamabad has received excellent response from investors across Pakistan and abroad over the past couple of months. This is due to major developments including fast-paced development work as well as a couple of big companies joining in to set up their branches in the first ever smart city concept housing scheme in Pakistan. Even with the depressed economic conditions of Pakistan, especially the real estate sector, Capital Smart City stands out as one of the most selling properties in Islamabad. Here the all the updates regarding this project. The golf course is expected to be ready by the end of 2019. Mövenpick Hotels & Resorts has signed an agreement with Smart Properties to open up a branch in Capital Smart City Islamabad. The hotel will feature 250 hotel rooms, 150 serviced apartments, four dining venues, meeting facilities, a fitness center, and two swimming pools. The project is expected to be ready by 2023. Overseas residential and commercial plots in Capital Smart City are one of the best buying options due to early possessions, therefore own(profit) prices are increasing day by day. There are rumors in the market that Habib Rafiq (Pvt.) Limited (HRL) has sold thousands of files without acquiring land. However, our sources confirm that the company has already acquired more than the planned land – master planning has been done for 40,000 kanals but purchased land is above 50,000 kanals. 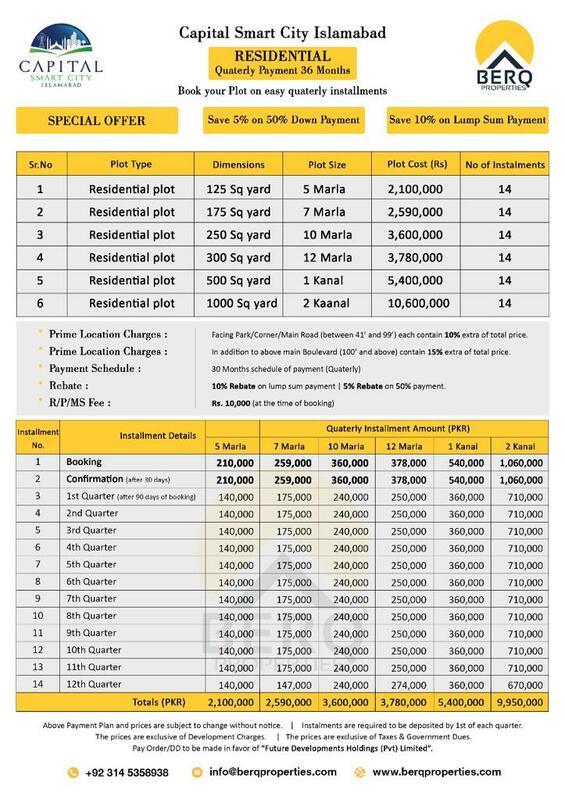 Capital Smart City recently launched limited 5 kanal and 10 kanal luxury farmhouses on easy installments. The prices may seem a bit expensive though the planned features and development standards justify the prices. Those who want to enjoy the luxuries of life while living in a natural environment, Capital Smart City Farm Houses is one of the best options available today in Islamabad. HRL is gradually increasing its workforce and vehicles to speed up development work at Capital Smart City. And you can see dozens of different types of vehicles engaged at various spots of the society. Initial possessions may start from 2020, while different blocks of the society can take 3 to 5 years or so until possessions are ready for handover. 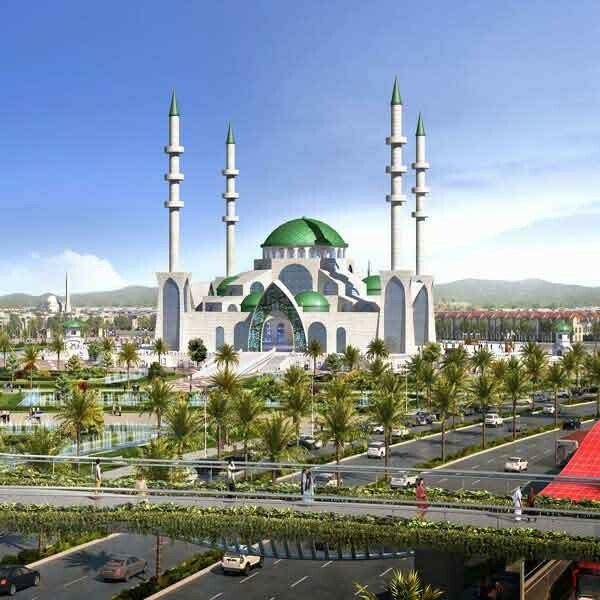 Capital Smart City is one of the most attractive and best real estate investment opportunity in Islamabad/Rawalpindi. Therefore, we recommend you to consider this investment opportunity for handsome returns in the medium term. Here’s Why You Must Invest Here?